This is one of the most asked questions that I have been getting since the release last week of Red Hat JBoss BRMS & Red Hat JBoss BPM Suite v6 products. For this article, I will be referencing JBoss BPM Suite product as this is a super set of the JBoss BRMS product. This means that all I describe below in this solution below applies to both products. It all has to do with the new development and deployment models that are introduced when the repository being used is GIT based. If we take a closer look at the JBoss BPM Suite architecture we see that the repository linking business users and the development teams is a GIT repository. The usual work flow would have the business analysts working in the JBoss BPM Suite web based GUI tooling using model designers, process designers, and various rule designers to put together their projects. Once this has been completed, or parallel to this work, developers in the organization can work on their applications and contribute to support the business analysts with updates. Receiving objects: 100% (266/266), 47.97 KiB, done. As of the final product release, it is no longer possible to push your changes without authentication. DSA key fingerprint is 62:c2:c5:4c:22:3a:dd:8e:24:34:bf:3f:16:e7:3c:73. Writing objects: 100% (3/3), 282 bytes, done. 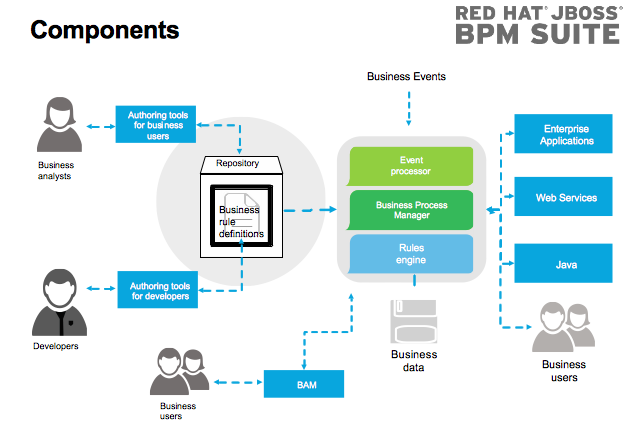 I hope this helps you along as you explore and expand you knowledge while developing your BPM projects with the JBoss BPM Suite.